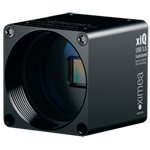 Image sensor size 1/2.3", 1/1.7" and up to 2/3"
The lens is designed with multiple aspherical elements to achieve 300 lp/mm resolution for a crisper, higher detail image. 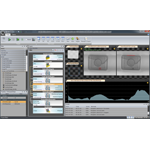 The high resolution performance enables improved detection and accuracy for inspection of flaws from greater distances, identification of smaller objects, and for general non-destructive testing and inspection applications. 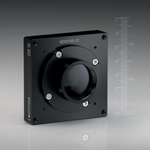 The ML610M lens is IR corrected for 440nm to 940nm, maintaining focus in NIR with only a 5 micron focus shift. The great NIR performance facilitates more sensitive agricultural inspection, and other multi-spectral applications. The lens has great light gathering ability with F/1.7 and very few ghosts or aberrations. Theia employs multi-layer coatings and Extra Low Dispersion (ELD) glass types to result in over 57% transmission. Theia's full featured ML610M lens remains compact and lightweight, weighing in at 70 grams with a 17.3mm clear aperture, a 59mm outer diameter, and 51.5mm lens length. The compact size allows the lens to fit in more tight envelope locations and the light weight facilitates greater mobility and stability. 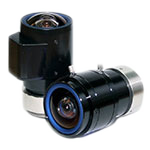 The lens is able to withstand vibration from 20-200Hz at 10G/axis. Copyright c 2009 Fadracer Technology Inc. All Rights Reserved.